There are thousands of homeless people living in Austin and many of them are veterans. They served our country and now they need our help in finding the stability, safety and comfort that comes with having your own home. 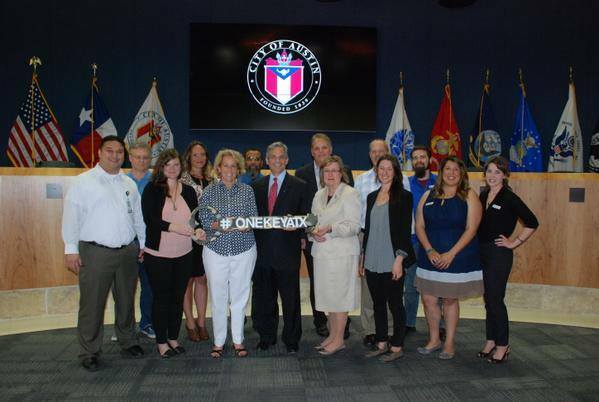 OneKeyATX is an initiative to find affordable homes for 234 homeless vets in Austin by January of 2016. It’s a partnership of the City of Austin, Travis County, the Veterans Administration, and several nonprofits including Caritas of Austin, the Ending Community Homelessness Coalition (ECHO), Front Steps, Goodwill and the Salvation Army. They’re all working to encourage landlords and property owners to set aside one unit for a homeless vet or veteran family that may have rental barriers. You’ll find more information on OneKeyATX here. The program is already a fourth of the way toward its goal. One veteran who has been placed is 60-year-old Michael Moorehead. Moorehead was in the Navy from 1975 to 1978 and afterward he got his bachelor’s degree and went to work in medical billing. In 2014, Michael lost his job and that caused him to be evicted from his apartment. For a short time he was sleeping in his car, until it was repossessed with him in it! Then, he was on the streets for six months and sleeping in the laundry room of an apartment complex. He did find a part time job, but he doesn’t make enough to pay rent with that income alone. A Caritas of Austin client, Michael is now living in a spacious one bedroom apartment in Northeast Austin through OneKeyATX. 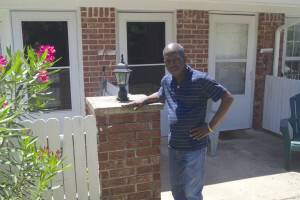 Caritas has helped him cover initial rent payments and some housing necessities. With this fresh start, Michael is now confident he will find a full time job that will allow him to remain in the apartment and be self-sufficient again. Click on the video below to hear his message to Caritas and others who have helped him overcome homelessness.